Stir with ice, strain into a cocktail glass, and garnish with a lemon twist. (*) The ingredient name is an effort to avoid the word "syrup" because guests will assume that the drink is too sweet. Two Fridays ago, I tested out my new menu idea at Nahita and got some feedback. I had made a celery syrup as I had done for a drink at Earl's Cocktail Lab a year or so ago, and I was planning on trying out two few directions with citrus. However, one of the stirred drinks was coming off the menu, so I opted for my Martini variation idea. As a starting point, I considered the structure of the Diamond Queen that I had crafted for the Tales of the Cocktail Martini competition in 2017, and I figured that celery would work well with cachaça which to date has not been utilized on our list (celery would definitely work great with tequila and mezcal which are already present and accounted for though). Given how well Hendrick's worked in my take of the 1937 Rio Grande that was a gin-tequila Manhattan of sorts, I started with that gin for my base and paired it with a minor amount of Avua's unaged cachaça. Given that Dolin Dry Vermouth is 29 g/L sugar and 1:1 simple syrup is around 500 g/L, a 3:1 ratio puts the sugar content around 150 g/L which is approximately the sugar content of sweet vermouth. While the combination tasted pleasingly grassy and herbal, it felt a little flat; a dash of absinthe helped that out by donating a bright complexity. For a name, I had H.L. 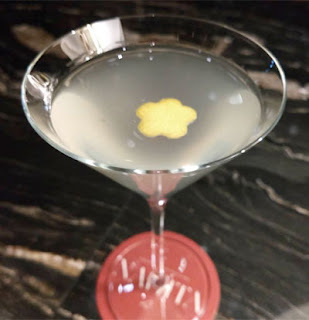 Mencken's quote, "Martinis are the only American invention as perfect as the sonnet," fresh in my head from reading Kate Hawking's Aperitif book, and I recalled how we passed around a book of limericks at a Hendrick's event a few years ago. While the five line poem form was named after the Irish town, it was the Scots who took the art form to higher (and lower) levels. Therefore, I dubbed this quirky number As Perfect as a Limerick. My guest later that night in the Fenix Speakeasy who requested a Martini-like drink quite enjoyed the final form.